The city of San Jose will break ground on its first-ever ethanol fuel station Wednesday. The ethanol (E85) will be located at the Chevron station at 680 Commercial Street near Highway 101 and the San Jose Municipal Golf Course. Pearson Fuels, a San Diego company, is supplying the ethanol for the station. The five-year-old company claims to have been the first in the United States to supply the fuel for a gas station. The company has said it will be supplying fuel to eight stations in California in the coming years. The statewide rollout of new E85 stations also includes upcoming groundbreakings Oct. 16 in Carmichael and Sacramento. North San Diego County’s first ethanol station opened in Carlsbad on Oct. 7. Riverside County’s first stations held groundbreaking events in Perris and Beaumont on Oct. 8. The East Bay’s first ethanol fuel station will open Oct. 14 in Concord. The Bay Area’s first station will also be announced on Oct. 15 in Hayward. Company officials have said 86 sites will be opened nationwide in the next several months. 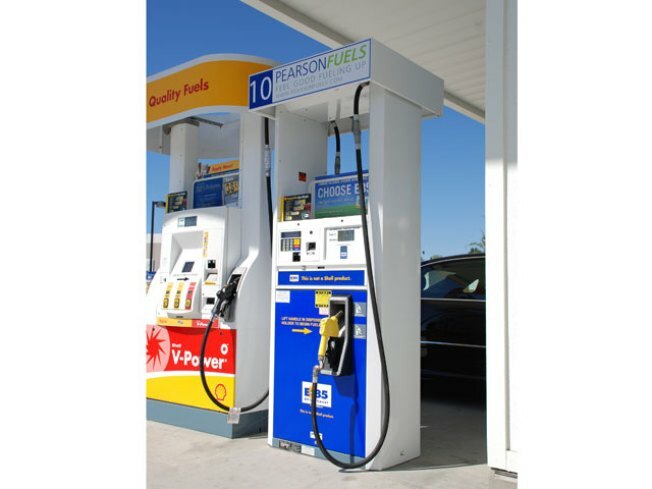 Pearson brought the first Ethanol station to the state of California, the first Biodiesel station to San Diego and the county's first dual pressure compressed natural gas station. Pearson featured San Diego's largest electric vehicle charging facility, the county's first propane vehicle fueling station and was the first independent station in San Diego to offer ultralow sulphur diesel. Company officials said they started the firm partly in response to the federal Clean Cities Program. The program is a government-industry partnership designed to reduce petroleum consumption in the transportation sector by advancing the use of alternative fuels and vehicles, idle reduction technologies, hybrid electric vehicles, fuel blends, and fuel economy measures.